Summary: The Archie Carr National Wildlife Refuge receives more nesting by threatened loggerhead turtles than any other beach in the western hemisphere and more nesting by endangered green turtles than any other beach in the United States. The 21-km (13 mile) stretch of beach in south Brevard County accounts for approximately 25% of the loggerhead nesting and 42%-49% of the Florida green turtle nesting in Florida’s Index Nesting Beach Program each year. Leatherback and Florida green turtle nesting are rising exponentially at the Carr Refuge; green turtles at an unprecedented 13.9% per annum (Chaloupka et al. 2008). 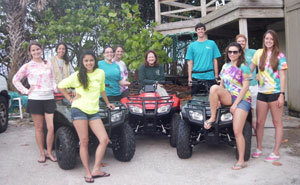 The UCF group has worked in this area since 1982, surveying the beaches, tagging turtles, and conducting many and various research projects during that time. It is arguably one of the longest running sea turtle research projects in the U.S., and perhaps the world. Funding for this important nesting beach has been dwindling in recent years and the UCF group to date has far less than is needed for the upcoming season, making it impossible to purchase replacement equipment. Small all terrain vehicles (ATVs) are used daily to accomplish morning nesting surveys and to increase nightly encounters with specific species at different times of the nesting season to conduct specific research. This project will fund three new ATVs and the cost of the first service for these vehicles to help us continue our nesting beach work in 2013 and beyond. Results: We surveyed the Carr Refuge beach from 1 March until 31 October. These ATV s helped us collect both Statewide and Index data from the time they were purchased and delivered on 10 May 2013. They were also used at night to look for leatherbacks and to search for returning satellite transmitter turtles. The 2013 season will long be remembered for its incredible number of green turtle nests, whether it is an exciting anomaly or the first year in a trend of increased nesting. It is the first year that Florida green turtle nest numbers exceeded that of loggerhead nests at the Carr Refuge. During the 2013 nesting season we counted a total of 10,933 loggerhead nests, 11,840 Florida green turtle nests and 24 leatherback nests. The last nest of the season was found on 25 October.